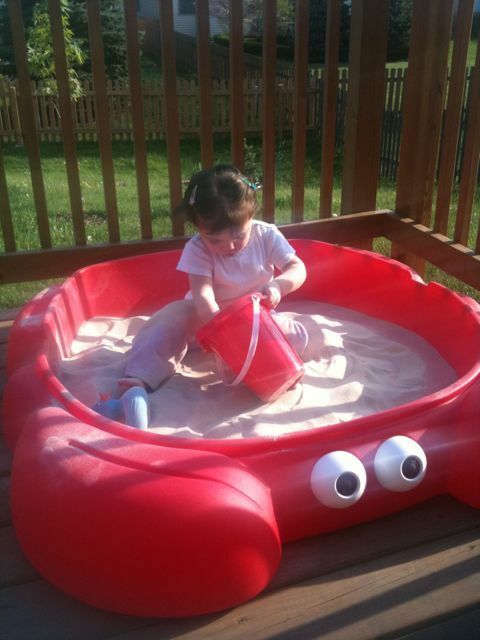 Melanie got a new sandbox! We were going to get the green Turtle Sandbox (I remember having one when I was young) but found this red Clam held twice as much sand! The sandbox barely fit in Heather’s Prius, luckily it did fit! It can hold up to 6 – 50lb bags of sand (The green turtle sandbox holds 3 – 50lb bags). Heather had the great idea of putting the sandbox on the deck that way he sand doesn’t kill the grass. ← Shopping for a new Gas Grill – Weber for the Win!